NETWORK UPDATE: HOLLYWOOD GAME NIGHT fell 0.1 in final numbers, as did the rerun of NCIS: NEW ORLEANS. CABLE HIGHLIGHTS: Discovery’s DEADLIEST CATCH ruled Tuesday cable, up 0.14 to 1.00, and with its lead-in DEADLIEST CATCH: THE BAIT at 0.49. THE HAVES AND HAVE NOTS (OWN) rose 0.08 to 0.89. On Spike, INK MASTER and TATTOO NIGHTMARES returned at 0.80-0.52. TNT’s RIZZOLI & ISLES (recently renewed for a shortened 13-episode season) lost 0.03 to 0.76, yet PROOF gained 0.06 to 0.30. On ABCFamily, PRETTY LITTLE LIARS lost 0.05 to 0.74 (and was down a tenth in F12-34s to 1.79), and STITCHERS made a case that its renewal was justified by jumping 0.13 to 0.36 (and up 0.15 in the demo to 0.69). History’s COUNTING CARS rose 0.09 to 0.52, and LEEPU & PITBULL squeezed out an extra hundredth to 0.50. On TBS, CLIPPED climbed 0.08 to 0.47. Bravo’s REAL HOUSEWIVES OF NYC fell 0.05 to 0.46. The season premiere of Syfy’s FACE OFF was at 0.43. DANCE MOMS (Lifetime) was steady at 0.42. FX’s TYRANT gained 0.03 to 0.40. On TLC, MY GIANT LIFE dropped 0.12 to 0.40, and LITTLE PEOPLE BIG WORLD fell 0.08 to 0.39. USA’s WWE TOUGH ENOUGH lost 0.05 to 0.35. The just-renewed SCREAM (MTV) fell 0.04 to 0.29, and was down 0.03 in the F12-34 demo to 0.74. 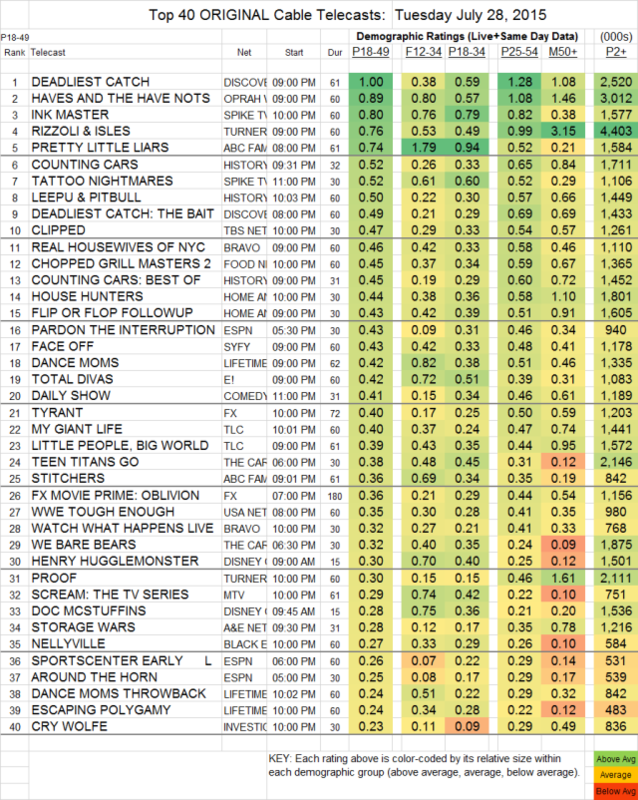 On A&E, STORAGE WARS dropped 0.05 to 0.28, and BIG SMO was at 0.18/0.15 compared to last week’s 0.24/0.20. ANOTHER PERIOD (Comedy) lost most of last week’s gain, down 0.12 to 0.22. BIG BROTHER AFTER DARK (POP) was at 0.07/123K.